Whenever Windows is not working properly, most of the time the first thing that knowledgeable users will do is boot the computer into Safe Mode and see if the problem still persists. If Windows will only boot into safe mode and not normal mode, then typically it has a major problem such as disk corruption or the installation of poorly configured software or hardware driver that prevents the operating system from successfully booting normally. Windows in safe mode will have reduced functionality, but the task of isolating problems is easier because many non core components are turned off. Although Safe Mode is very useful for troubleshooting computer problems, it can also be used to bypass some security software that will auto start with a normal Windows boot. An example is if you installed an internet monitoring software which restricts or watches your children to use the computer at certain times, they can simply boot in to Safe Mode if they know how and use the computer the whole day. There are times when we need to disable Safe Mode for extra security. There isn’t one single setting to disable Safe Mode in Windows, but a number of hacks and workarounds. Here’s some for you to have a look at. 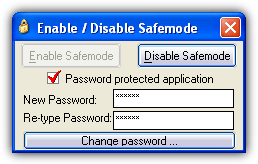 Firstly we’ll show you some ways you can disable safe Mode if you’re using Windows XP. Quite a well known method is to modify your system registry with the idea of renaming the keys that Safe Mode relies on to boot, this in turn causes the computer to reboot or throw up a blue screen of death if anyone tries to get into Safe Mode. Just follow the steps below on how to accomplish it. 1. Go to Start -> Run (or Win key+R), type regedit and press enter. 3. Expand the SafeBoot key and you should see 2 sub keys with the names Minimal and Network. DON’T delete them, but rename both of the keys to something else, for example, Minimal to MinimalX and Network to NetworkX. Now if you try to boot in to Safe Mode, it doesn’t matter if you select the normal Safe Mode, Safe Mode with Networking or Safe Mode with Command Prompt, the computer will either auto reboot or throw up a blue screen of death (BSOD) with a STOP error. To enable Safe Mode again, just go back into the registry and rename MinimalX to Minimal and NetworkX to Network. This solution isn’t perfect because anyone who knows about this trick can simply modify the registry to re-enable Safe Mode. If Windows doesn’t boot and you want to get into Safe Mode, you will need to edit the registry keys offline using a boot CD. 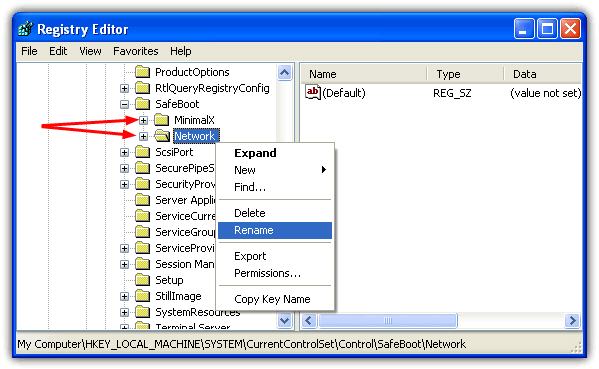 Follow the instructions in our article “How To Edit Registry Key Values without Booting into Windows“. If you’re not comfortable in modifying your system’s registry, here’s a small free tool called Enable/Disable SafeMode which does just that. Basically it does the exact same thing as above which is renaming the SafeBoot Minimal and Network keys. You can also set an application password to prevent unauthorized access to this tool. The program is easy to use and is pretty much self explanatory, click the buttons to enable or disable and optionally supply a password to stop any unauthorized use of the tool. Actually, if you can create a Limited User account, you wouldn’t need to use this registry hack because a limited user cannot access the registry. These registry edits are solutions to those that for some reason don’t want to create a Limited User. This method is to hex edit the hidden NTLDR file in the root of the drive where the operating system is installed. This won’t work on anything above XP because newer operating systems use BOOTMGR/Winload.exe. Follow the steps below. 2. Go to the C: drive and make a backup copy of NTLDR and either keep it in the root of C: as “Copy of NTLDR”, or keep it in a safe place. 3. 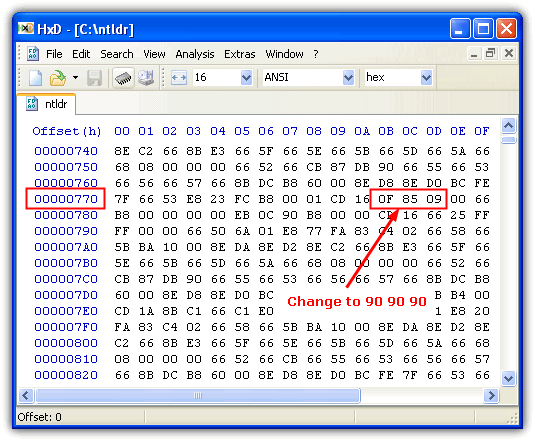 Download HxD, a freeware portable hex editor, extract and run HxD.exe. Drag and drop the ntldr file onto the HxD window to open it for editing. 4. Scroll down the window a little and look for the offset line “00000770”, then change the values “0F 85 09″ to “90 90 90″. 5. Click the Save button (Ctrl+S) and close HxD. It will also create backup of the file with a .bak extension. The next time you restart your computer F8 will no longer work and have no effect before starting up Windows. This hack totally disables all keyboard input. There are still drawbacks to this method though because you can still get into Safe Mode using the /SAFEBOOT option in the Boot.ini tab from Msconfig. Obviously if you multi boot with different operating systems, you will also need access to the boot menu and keys to select the O/S. On the next page, we’ll show you how to disable the F8 key to access Safe Mode in Windows Vista, 7 and 8. Will any of these tricks work on windows 10 ? i had a terrible night rest until God showed me this link this morning and i promise to share it with others. a million thanks in a million languages is what i have to say for now. RIVERS OF JOY FLOWING IN ME. How can i get back to the normal safe mode screen,if i am getting a blue sceen.I am selecting safe mode and any other options and it is not going through..Please Help. How did you disable Safe Mode and which OS are you using? Amazing….this is a handy web site. Like you say, in the case of an abnormal shutdown, machines normally go into Safe Mode anyway, so all these are essentially moot fixes at best. Any ideas on how to edit the boot menu to make “Safe Mode with Networking” disappear? Thanks Raymond. That is pretty cool. It works now i could away loser from my computer. Enlightening product Ray. A must have for the security conscious people. Another great tip thanks mate!